The Qutub Complex is a fine example of the Indo-Islamic style of architecture. The artists employed by Aibak and Iltutmish were Hindus and the raw material was also obtained from existing Hindu and Jain temples. The figures carved on the pillars were disfigured by them. The buildings of the Qutub Complex are listed in the UNESCO's World Heritage Sites in India. The major buildings in Qutub Complex are the Qutub Minar, Quwwat-ul-Islam Mosque and the Iron Pillar. Qutub Minar is the highest stone tower and one of the finest Islamic structures ever raised in India. It belongs to the 13th century. In 1199 work began on this tower which was intended to be the most glorious tower of victory in the world. This tower was damaged twice and repaired in 1326 and 1368. This tower was the prototype of all towers in India. Qutub Minar is not only the Delhi's recognised landmark, but also one of the finest monument in India and the world. According to a legend the Qutub Minar was built by Prithviraj Chauhan, the last Chauhan king of Delhi, for enabling his daughter to behold the sacred river Yamuna, from its top as part of her daily worship. Qutb-ud-din-Aibak was influenced by the brick victory pillars in Ghazni in Afghanistan, so he built the Qutub Minar in 1199 AD. The Qutub Minar is made up of red and buff sandstone. This tower also served as the minaret attached to the Might of Islam Mosque. From here the muezzin could call the people for the prayer. The building is 72.5 m high and has 379 steps from the bottom to the top. 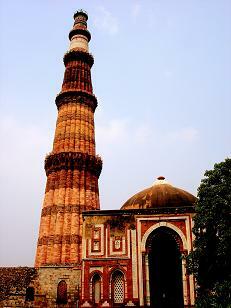 The Qutub Minar is about 47 feet at the base and tapers to 9 feet at the apex. The tower is ornamented by bands of inscriptions and by four projecting balconies supported by elaborately decorated brackets. The Minar is tapering with the diameter of the base is 14.3 m while at the top floor it is 2.7 m. It took about two decades to complete this monument. Qutb-ud-din-Aibak raised the first storey, to which were added three more storeys by his successor and son-in-law, Shamsu'd-Din Iitutmish. It is a red sandstone tower covered with intricate carvings and deeply inscribed with verses from the holy Quran. Beautiful calligraphy adorns the adjacent edifices. The development of architectural styles from Aibak to Tughlak are also evident in this Minar. The tower has five distinct storeys, each storey surrounded by a projecting balcony. The first three storeys are made of red sandstone, the fourth and fifth of marble and sandstone. All the storeys are supported by stone brackets, which are decorated with honeycomb design. The first storey and its balcony has the curved and fluted design. The second storey has only curved design while the third storey has only fluted design. The first damage occurred during Muhammed Tughlaq's rule and he repaired it in 1332. The second damage occurred during Firoz Shah Tughlaq rule. The uppermost storey was damaged during his rule in 1368. Originally, the Minar had only four storeys. He replaced the uppermost storey by two storeys, making free use of marble but leaving the lower portion of the fourth storey built with sandstone in its original condition. Later in 1503, Sikandar Lodhi also carried out some restoration in the upper storeys. Quwwatu'l-Islam Mosque is located very close to the tower and one of the most magnificent mosque in the world. It is one of the earliest mosque built by the Delhi Sultans and the first mosque in India. This mosque was built by Qutub-ud-Din Aibak in 1198 AD. The main mosque comprises of an inner and outer courtyard. The inner courtyard is surrounded by an exquisite colonnade enclosed by cloisters, erected with the carved columns. It was supposed to have been built using the materials and masonry of the remains of 27 Hindu and Jain Temples. A lofty arched screen was erected and the mosque was enlarged by Iltutmish and Ala-ud-Din Khalji. Alai Darwaza, the southern gateway of the Quwwat-ul-Islam mosque was constructed by Ala-ud-Din Khalji in 1311 AD. The gateway is the example of the use of horseshoe arch and true dome for the first time. This is the first building, which employed Islamic principles of construction and ornamentation. 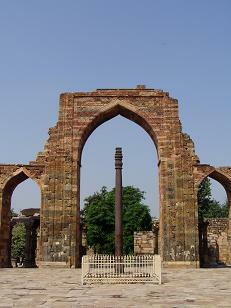 Within the mosque complex stands the famous Ashoka Iron Pillar, which belongs to 4th century AD. This pillar bears a Sanskrit inscription in Gupta script. This inscription states that the pillar was set up as a flagstaff in the honour of god Vishnu and in the memory of a mighty king, Chandragupta II. A deep hole on the top of the pillar indicates that an additional member, perhaps an image of 'Garuda', was fitted into it to answer to its description as a standard of Vishnu. This pillar was brought here from somewhere else, as no other relics of the 4th century were found at the site. The pillar also highlights ancient India’s achievements in metallurgy. The pillar is made of 98 per cent wrought iron and has remained rust free for about 1600 years. According to local belief if you stand with your back to the pillar and hold your arms around it, your wish will be granted.